Do you frequently drink wine, coffee, or soda? Do you also consume a lot of colored and dyed foods? As a result, you may have noticed that some of your teeth are slowly becoming discolored, or have developed darkening stains. You may be asking yourself what you can do to help restore your smile’s brilliance and the answer may lie in teeth whitening at Family and Implant Dentistry in Lincoln, NE. Teeth whitening is exactly what it sounds like: a chemical process that whitens the teeth through safe methods of bleaching, until it reaches the desired shade of white. This can be done with a whitening solution, bleaching gel, bleaching lamp, etc. either in a professional dental office, or through a take-home kit. Here at Family and Implant Dentistry, we chose to go with a more hands-on method, utilizing Crest 3D White Strips and Philips Zoom Whitening trays. Crest 3D White Strips are thin strips of bleaching solution that is placed over the teeth. With each strip used, you’ll notice your smile whiten over time. Philips ZOOM! Whitening approaches whitening using trays that the patient wears for a specified amount of time, according to Dr. Hoffman’s instructions. These trays are custom-designed to fit the patient’s teeth, and patients apply their own whitening solution to the trays before placing the trays in their mouth. After the allotted time has passed, the trays are removed and rinsed. Dr. Hoffman will take a look at your oral health and help determine which whitening treatment is best for your needs. During this consultation, you can ask us questions, see before and after cases, and more. Why Choose Teeth Whitening with Dr. Hoffman? White teeth are often seen as more confident, youthful (no signs of aging), and the appearance of optimal health. 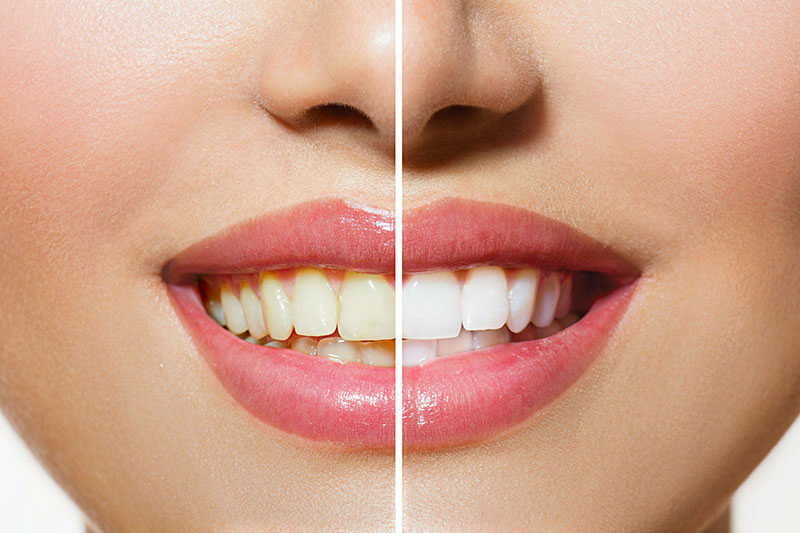 If your teeth have been damaged and stained as a result of past diseases or darkened foods, whitening them can give them the brilliant shine they deserve. Teeth whitening with Dr. Hoffman eliminates the guesswork about the reliability of certain store-bought products. Your treatment is guided and controlled by our dentist, and can be adjusted as needed. For more information about in-office whitening versus at-home whitening, check it out here. Teeth whitening can be a great confidence boost for patients who feel their smiles are too damaged beyond repair. Instead, consider undergoing this treatment in the experienced hands of Dr. Hoffman. Contact us today to schedule that consultation and learn more about what teeth whitening can do for your smile.